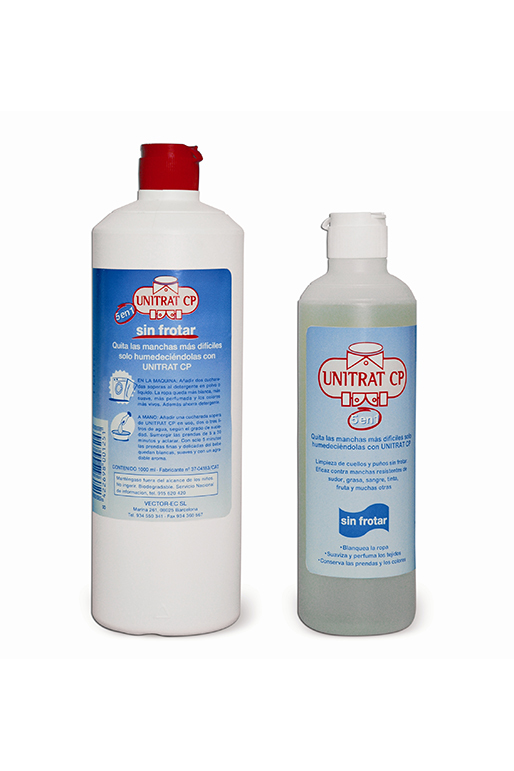 UNITRAT COLLARS AND CUFFS , vectem s.a.
Universal stain remover and whitener. Impregnate stains and rub marks with Unitrat CP. Brush the most stubborn stains and then hand or machine wash.
Delicate garments and baby clothes should be soaked with one tablespoon of Unitrat CP for every three litres of water. Rinse after a few minutes. Softens clothes and leaves a pleasant scent. In the wash, add two tablespoons of Unitrat CP to your powder or liquid laundry detergent. Your laundry will come out cleaner and your garments softer, their colours more vivid and intense. Packaging: bottle of 500 ml and 1 litre.